After almost 10 years, on May, we said goodbye to the Google Webmasters tools to welcome the new Google Search Console. Google commented that this change was not only interesting for the webmaster behind a web, but that there are now many more profiles interested in a site being visible to search engines. Hence the change in name became effective. There was not much new on the new interface, which offered the same tools and the same data. However, this did not mean that Google did not count on adding new functionalities. In fact, to the date Google had not stopped improving the tool constantly, and of course later on it has added new features. Technically this was not included after the name change, but it happened almost at the same time, so we include it here due to its importance. Since May there was an important change on this report because of the quantity and quality of the information about searches. Now the information can be filtered in many ways, which allows for a deeper understanding of the user and a more precise analysis for search engines of the performance of the site. • It is a lot more customizable and allows, among other things, to compare queries by device, country and search type. • The information can be grouped by queries or pages. • You can compare all the values: queries, pages, devices, countries, search type and dates. Soon after renaming the Webmasters tool, Google also announced that it would add information about content indexing for mobile apps. To use this functionality we need to have an Android or iOS app. After we have added the Google Search Console app and the propriety has been verified, we can get information about its behaviour on search engines with the search analysis report. We could for example get information about what content of the app is being printed on the results pages, which pages are the most popular or which have errors. What is more, with the function explore like Google we can check how the indexed content of an app will appear on the search results. This allows us to know how Google is seeing our app and if there are any problems with it. This is the latest added functionality-announced on August, 5th-and it is perhaps one of the most important because at last it seems that Google makes available data that it did not offer before, that is, information about the behaviour of the website on search engines and about how the public is accessing these pages. 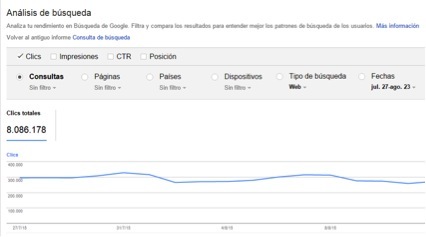 With the new API we can access the search analysis report and get a lot more easily all the information about queries: impressions, clicks, ctr and average position, and also filter it using different criteria like device, country or page. API basically offers webmasters new alternatives to obtain and “play” with the queries for searches related with their sites. 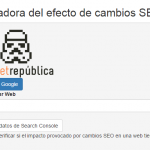 This information will be especially useful for improving the SEO control panel for the tracking of projects. Moreover, there is no doubt that this could be used by many SEO commercial tools to provide more precise metrics in following queries and internal pages. 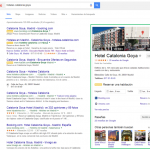 • It gives back 5,000 results per query. • If we apply some filter to the information in the query we might get less results than expected. This could be due to some of the data of the query not being associated to the dimension. In addition to the usage examples provided by Google and taking into account that it is an improvement over the API that existed already, some people have decided to update the scripts they used to adapt them to the new API. Here you have a link to a post where there is a script with which every month our server automatically downloads all the data for the search analysis report. This would avoid the problem we have now where we cannot get data which is more than three months old. As more information is published we can start working basing us on the documentation from Search Analytics API. We can conclude from what has been said that GWT, this inaccurate and hardly useful tool, is without doubt fading out. The permanent improvements on the app, adding new functionalities every so often, make Google Search Console an ever more important tool for daily work with SEO.